Preheat oven to 400°F and prepare a baking sheet with parchment paper or cooking spray. Measure out 2 tablespoons of Classico® Riserva Marinara Sauce into a large mixing bowl and set aside the remainder of the sauce. Add the ground chicken, egg, breadcrumbs, Parmesan cheese and salt and pepper into the mixing bowl with the sauce. Bake for about 20-25 minutes until fully cooked and no longer pink on the inside. 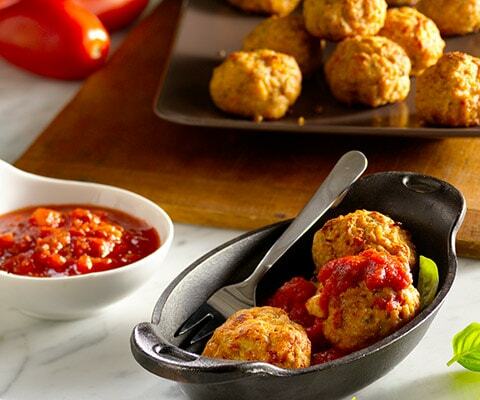 While meatballs are baking, warm remainder of the Classico® Riserva Marinara Sauce in a small sauce pan. When meatballs are finished cooking, serve using toothpicks with the warmed tomato sauce or use to top a dish of pasta. These are the best chicken meat balls ever invented. I have a loved one whose diet is limited, and made these originally so he could enjoy his favorite Italian style foods. The Riserva sauce is the best commercial sauce out there. We have tried the other flavors and now are sticking with the Marinara. (I'd like to use the basic meatballs with other flavorings, so if you've worked out a recipe, let me know!) He is a happy diner now, and I am a happy cook! I absolutely love these meatballs. I actually make them once a week and eat along with a salad and they are so good! I highly recommend them.